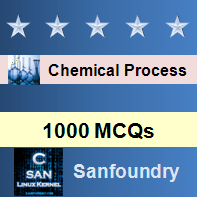 This set of Chemical Process Calculation Multiple Choice Questions & Answers (MCQs) focuses on “Energy balance for Different type of systems – II”. Explanation: Change in the internal energy for a steady-state system is always zero. 2. For a steady state system, 10 J of heat is supplied to the system, what is the work done by the system? Explanation: Change in the internal energy for a steady-state system is always zero so Q = W.
3. If x J of work is done on a steady system, what is the heat for the system? Explanation: Change in the internal energy for a steady-state system is always zero so Q + W= 0. 4. 10 J of heat is removed from a steady state system, what is the work done on the system? Explanation: 0 = – 10 + W.
5. 25 J of work is done by a steady state system, what is the heat supplied to the system? Explanation: 0 = – 15 + Q. 6. 20 J of heat is supplied to a system and a work of 30 J performed on it. If 50 J of heat is removed from the system, which type of system is it? 7. 10 J of heat is supplied to a system and a work of 30 J performed on it. If 50 J of heat is removed from the system, which type of system is it? Explanation: ∆E is not equal to zero. 8. If 25 J is work is done on a system and same amount of heat is also supplied. What kind of system is it? 9. If 25 J is work is done by a system and same amount of heat is also supplied to the system. What kind of system is it? Explanation: ∆E is equal to zero. Explanation: There must be no accumulation of mass or energy over the time period of interest in a Steady state.